per year! That’s 160,000 a second! And over 700 a year for every single person on the planet. We can do better than that. See plastic bags used per year in real time below. This year 5 trillion plastic bags will be consumed. That’s 160,000 a second! Put one after another they would go around the world 7 times every hour and cover an area twice the size of France. Less than 1 percent are recycled. They are most often made from Polyethylene that takes centuries to degrade. Each ton of recycled plastic bags saves the energy equivalent of 11 barrels of oil. What happens to the plastic bags? In the ocean, the plastic is broken down to tiny pieces. These pieces are eaten by fish and cannot be digested. Consequently the plastic builds up and enter into the food chain. Seabirds, turtles, seals, sea lions, whales and fish eat the plastics. The death of one sperm whale found in California (USA) in 2008 was caused by 22.2 kilos of plastic that the whale had eaten. Check out the video on plastic bags and their way to the 'Pacific garbage patch'. 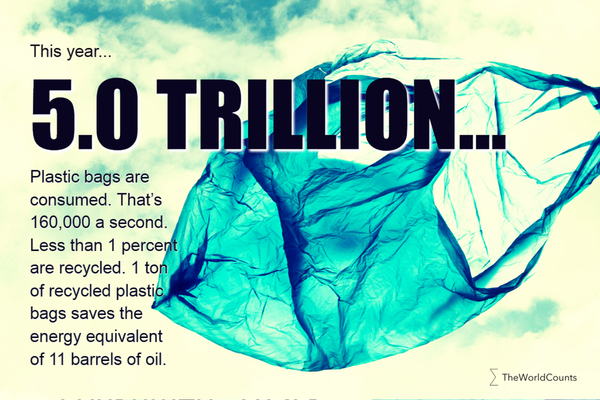 The Worldwatch Institute estimates that 4-5 trillion plastic bags were produced in 2002. We guess the number hasn’t gone down since then and use the upper estimate of 5 trillion. Narrated by Academy Award-winner Jeremy Irons, this "mockumentary" video, hammers home the stark reality of the plastic bag pollution situation. Interested in more facts like the plastic bags? Then plug in and subscribe to our newsletter.